Aromatase inhibitor (AI)-related bone loss is associated with increased fracture rates. Vitamin D might play a role in minimising this effect. We hypothesised that 25-hydroxy-vitamin D concentrations [25(OH)D] after 3 months supplementation might relate to bone loss after 1 year on AI therapy. 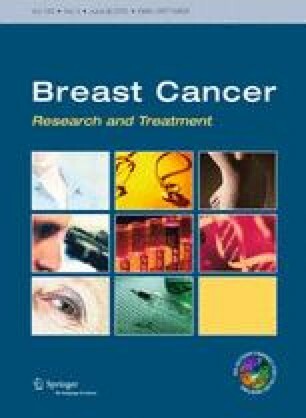 We conducted a prospective cohort study from January 2006 to December 2011 of a consecutive sample of women initiating AI for early breast cancer who were ineligible for bisphosphonate therapy and stayed on treatment for 1 year (N = 232). Serum 25(OH)D was measured at baseline and 3 months, and lumbar spine (LS) bone mineral density at baseline and 1 year. Subjects were supplemented with daily calcium (1 g) and vitamin D3 (800 IU) and additional oral 16,000 IU every 2 weeks if baseline 25(OH)D was <30 ng/ml. Linear regression models were fitted to adjust for potential confounders. After 1 year on AI therapy, 232 participants experienced a significant 1.68 % [95 % CI 1.15–2.20 %] bone loss at LS (0.017 g/cm2 [0.012–0.024], P < 0.0001). Higher 25(OH)D at 3 months protected against LS bone loss (−0.5 % per 10 ng/ml [95 % CI −0.7 to −0.3 %], adjusted P = 0.0001), and those who reached levels ≥40 ng/ml had reduced bone loss by 1.70 % [95 % CI 0.4–3.0 %; adjusted P = 0.005] compared to those with low 25(OH)D levels (<30 ng/ml). We conclude that improved vitamin D status using supplementation is associated with attenuation of AI-associated bone loss. For this population, the current Institute of Medicine target recommendation of 20 ng/ml might be too low to ensure good bone health. This project has been partially funded by the Instituto Carlos III (FIS Grants 2010, Expedient number PI10/01464). Daniel Prieto-Alhambra receives support from the IDIAP Jordi Gol and Institut Catala de la Salut (“4a Convocatòria d’una estada a una Unitat de Recerca de l’IMIM o de l’ASPB”). The Department of Medical Oncology was supported by “ISCIII/FEDER-Subdirección General de Evaluación y Fomento de la Investigación (PI06 PI10/01464)”, which is part of the “Plan Nacional de Investigación Científica, Desarrollo e Innovación Tecnológica (I+D+I), iniciativa Ingenio 2010, Programa Consolider”, Instituto de Salud Carlos III/FEDER, Spain (RD06/0020/0109; RD06/0020/0019). The Internal Medicine Department and the URFOA IMIM receive support from the RETICEF (Red Temática de Investigación Cooperativa en Envejecimiento y Fragilidad, Instituto Carlos III, Government of Spain). Dr MK Javaid and Professor NK Arden receive support from the NIHR (National Institute of Health Research), Musculoskeletal BRU, Oxford. The authors thank Isabel Aymar for her technical assistance in the DXA measurements.